The Lewis Center for the Arts’ Program in Theater at Princeton University will present Hedda Gabler by Henrik Ibsen, directed by faculty member Tracy Bersley and featuring senior Sean Peter Drohan in the title role, on January 10, 11 and 12 at 8:00 p.m. with an additional performance on January 11 at 2:00 p.m. which will be followed by a talk-back discussion. Performances will take place in the Marie and Edward Matthews ’53 Acting Studio located at 185 Nassau Street. Premiering in 1891, Hedda Gabler has become a classic of world dramatic literature, receiving numerous productions, on film and stage, worldwide over the past dozen decades. The complex and controversial nature of the title character has long attracted many of the world’s greatest actresses from Elizabeth Robins and Eleanora Duse in the nineteenth century to Fiona Shaw and Cate Blanchett in recent years. This production will feature an adaptation by Pulitzer Prize-finalist playwright Christopher Shinn, written for the 2009 Broadway revival starring Mary-Louise Parker. This production will feature Drohan, a male actor, in the title role. This approach is highly unusual, but not entirely unprecedented. Charles Ludlam, avant-garde drag performer and pioneer, played the role at the American Ibsen Theater in 1984. 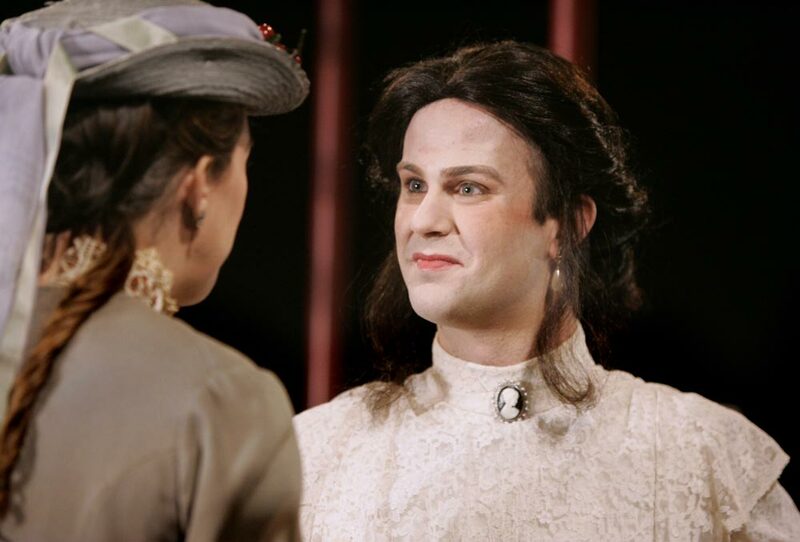 Drohan approached Bersley last spring with his senior thesis proposal to do Hedda Gabler. A professor of theater in the Lewis Center, Bersley directed last year’s acclaimed production of Shakespeare’s The Tempest, which used both actors and marionettes to portray the characters. In 2012 she directed a production of the Stephen Schwartz musical, Pippin, setting the story of the medieval prince in a post-Vietnam War veterans’ psychiatric hospital. Bersley has also directed a number of other Theater Program productions including The Winter’s Tale, A Streetcar Named Desire, and House of Blue Leaves, and completed a directing residency in 1999-2000 at McCarter Theatre where she collaborated with such artists as Sam Shepard, David Mamet, and Emily Mann. She has directed and choreographed for numerous other universities and theater companies such as New York University, The Juilliard School, the Public Theatre, The Acting Company, PS 122, and Lincoln Center in productions ranging from new adaptations to Shakespeare to opera. An active member of Princeton’s theater community, Drohan has previously been seen on the Lewis Center stage in Strange Faces (2011), an original musical about autism, and inElephants Graveyard (2012). He has also both performed and written for Princeton’s historic Triangle Club, for which he currently serves as Vice President, and has also recently appeared as the Emcee in Princeton University Players’ production of Cabaret. This past summer he received funds through the Lewis Center’s Alex Adam ’07 Award to travel to Norway to learn more about Norwegian culture and language in order to prepare for the part. The all-student cast also features Mary Lou Kolbenschlag ’14 as Thea and Tadesh Inagaki ’14 as Lovborg, Evan Thompson ’14 as Tesman, Jake Robertson ’15 as Judge Brack, Sarah Cuneo ’15 as Aunt Julie, and Maeve Brady ’15 as Berte. All of the cast and crew are certificate students in the Program in Theater at the Lewis Center. The production will feature a set design by Jeffrey Van Velsor, costume design by Sydney Maresca and lighting design by Mary Ellen Stebbins. Lily Gold ’14 serves as stage manager. The open discussion following the January 11 matinee performance will be led by Jill Dolan, Professor of Theater, Annan Professor of English and Director of Princeton’s Program in Gender and Sexuality Studies, along with popular drag performer Hedda Lettuce, and Drohan. Dolan recently received the 2013 Distinguished Scholar Award from the American Society for Theatre Research (ASTR) and received the 2011 George Jean Nathan Award for Dramatic Criticism for her blog, The Feminist Spectator. Tickets for Hedda Gabler are $12 general admission, $10 for students and seniors, and are available through Princeton University Ticketing by calling 609.258.9220 or on-line atprinceton.edu/utickets/, at the Frist Campus Center Ticket Office, and at the door prior to each performance.